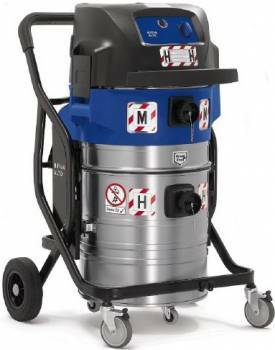 The Nilfisk-Alto Attix 965-0H/M XC is a H & M Class hazardous dust health & safety heavy duty vacuum cleaner / hoover. It has 2 x 1200 W motors protected by the Xtreme Clean automatic filter cleaning system. The Attix 965-0H/M has a drop down 70 stainless steel robust container on casters, & is designed to withstand the toughest of cleaning tasks, it will continue to clean powerfully & quickly day-in day-out.